Learn more at the official NPS Crater Lake website by clicking HERE. 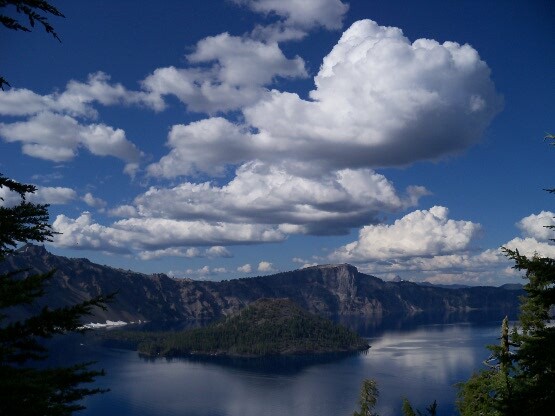 Crater Lake is an incredible locale to tour via a human powered recumbent tadpole tricycle. The vistas are world-class, and the terrain provides an excellent challenge for those trikers who seek to push their limits. About 7,000 years ago, give or take a few hours, the massive super volcano called Mount Mazama finally succumbed to numerous volcanic vents that had sufficiently weakened the mountain’s structure to a point that it finally collapsed into itself, leaving a colossal caldera that eventually over the eons filled with water. This spectacular region sits high in the Oregon Cascade Range, and a 35 mile paved road encircles the caldera around its rim. I have spent many years visiting this national park, the only one in Oregon, and have ridden through it on my ICE Qnt tricycle during the 2011 Coast to Cactus Tricycle Expedition. The experience is so memorable that I shall return. On one visit in 2010, I witnessed an annual bicycle rally that was riding around the rim. These folks were having a grand time. It’s only about 35 miles in circumference, yet the challenging ascents of the road in many places will work even the best triker. On this page are a few photographs I have taken this past year. If anyone develops any dreamy desire to ride their trike around this rim, I am always open to considering the expedition. The only two campgrounds in the park are on the south face of the steep mountain, and thus if one plans on camping with their trike as primary transportation, to the 35 miles must be added 14-18 miles of riding, depending on which campground is used. It’s all quick coasting down to the campgrounds, but super strenuous pedaling back up to the rim. To ride the rim only would require parking a car near the lodge, and then returning to it at the end of the day. Click on any of the miniature thumbnail images below to view an enlarged version. You may also watch a slide show of these photographs below the thumbnails. If you click on a thumbnail, an overlaying window will appear, and in that window, you may scroll through all the photos by using the arrow to the side. In the upper left, you will see an “ESC” button to dismiss the window and return to this page.